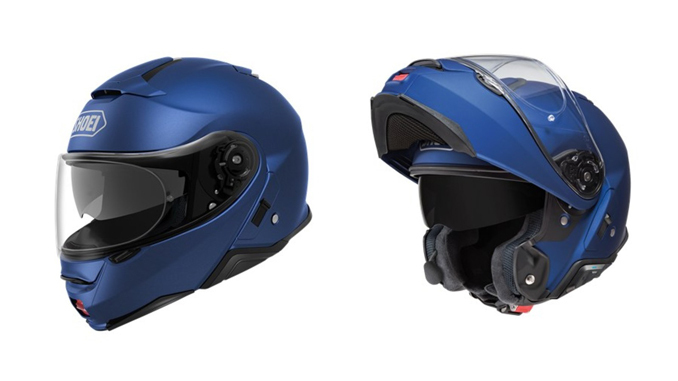 IRVINE, CA – March 6, 2018 – Sena, the industry leader in Bluetooth communication for power sports, is teaming up with Shoei, the world’s premier motorcycle helmet manufacturer to release a joint endeavor, the SRL Communication System for Neotec II. SHOEI® Safety Helmet Corp is proud to announce the Spring ’18 arrival of the all-new NEOTEC II to the North American marketplace, as well as the specially developed, SENA-exclusive SRL Bluetooth Communication System designed for seamless integration with the NEOTEC II. “SENA has made products that are compatible with SHOEI helmets in the past. But we’re proud to finally announce this joint endeavor,” says Tae Kim, CEO SENA Technologies, Inc.
SENA’s exclusive SRL Communication System is tailored specifically to the NEOTEC II helmet. When installed, the SRL is virtually undetectable from the outside of the helmet, and functions with a simple 3-button control. Chat with other riders via bluetooth intercom, listen to music, hear turn-by-turn GPS directions, and much more with the SRL. “We are excited to see SENA introduce a truly integrated communication system that has been specially designed for the NEOTEC II. The fact that there is no compromise to the appearance of our helmet nor the aerodynamic performance, including wind noise, is very exciting! SENA’s well-known history and innovative product design will no doubt positively enhance each rider’s experience on any journey.” – Moichi Tsuzuki, President of SHOEI North America. SENA is the global leader in Bluetooth Innovation for the motorsports, action sports and outdoor sports lifestyles – enabling real-time communication in the thick of the action. SENA offers its products worldwide through its global network of distributors, retailers and OEM partners. For information on SENA Technologies, Inc. and it’s full product line please visit www.sena.com or contact marketing@sena.com for more information. The name SHOEI® has long been synonymous with “premium” in the motorcycle helmet market – a credential that hundreds of loyal men and women in our Japanese factories wear with great pride. Just like the very first SHOEI® helmet built by our founder in 1959, every SHOEI® today is handmade in Japan utilizing a sophisticated process that involves over 50 people for each helmet. For more information, visit our website.